If still no article data are present or are present as 2D design, and/or as hand model, with VISI an efficient system for the article production is available for you. A 3D model of the article can be developed according to your specifications or by using existing 2D designs. Free forming surfaces or a parametric structure do not represent a problem. Construction of single and multiple molds. The construction of molds and models exclusively takes place in 3D, both with free forming surfaces and also simple geometries. 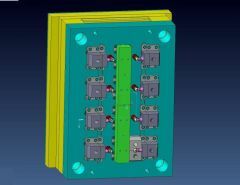 The advantages are clearly obvious: Mistakes can already be recognized and avoided during the construction phase and the produced 3D models afterwards are available for the derivative of the electodes and for providing miling programs by means of CAM software. A goal are qualitative and function-technically high quality tools, during minimization of the production times and optimum design of the construction units by means of constant 3D construction. Copyright © 2019 KTH Yildiz Kunststoffverarbeitung und Werkzeugbau. All Rights Reserved.